We begin the season of Lent, a season of introspection, confession, repentance, and absolution, with the story of Noah and the Flood. In the lectionary reading from 1 Peter 3, the author of that letter refers to the story of Noah, seeing in it a prefigurement of baptism, which serves as an appeal to God for a clean conscience. Thus, there is a connection between the letter and this word from Genesis. I’m preaching on the 1 Peter 3 text on Sunday, but in this reflection, I’ll leave aside the baptismal allusions, and focus on the covenant made with creation, and God’s seeming sense of regret at washing away life from God’s creation. I titled this reflection “divine repentance,” because I see in this reading a bit of remorse on the part of God regarding the actions taken, along with a promise to not go this route again. Passages like this serve as a reminder that in the biblical story God is known to have a change of mind. The idea that perfection requires unchangeability doesn’t seem to be part of the biblical view of things. So, in some ways this the story of God’s repentance as well as offering us a word of hope that such an event will not take place again. The story of the Flood runs through three chapters of Genesis (7-9). We only have a small portion in front of us, and what we have recounts the aftermath of the flood. To get context, we have to go back a few chapters, to when God commands Noah to build a large boat so that a remnant of God’s creatures, human and non-human, can be rescued. The reason for this action is that God regrets creating humanity and feels the need to start fresh, with a new world order. g path. So, God chooses to send a flood and wipe away the stain. Noah builds his God decides to use a flood to accomplish this goal. Since Noah seems to be fairly righteous, and therefore good stock to start over with, God invites Noah and his family to build an ark and bring aboard specimens of creatures large and small, so that a fresh start can be made. Children’s versions of the story like to feature elephants, zebras, and giraffes (but no dinosaurs—somehow, they missed the boat). When all the stalls are filled, and the family is on board, God shuts the door. Then the rain fell—for forty days and nights—and the flood waters emerge from beneath the earth. When the days of rain and flood end, the earth is covered by water. What was is no more. When we reach chapter 9, the earth has been cleansed by water, and God is ready to start again the process of filling the earth. God reaches out to this remnant, and makes a covenant with Noah, his family, and all the creatures on board the ark. Never again, will God unloose the waters to destroy the earth and its inhabitants. As a sign of God’s intentions, God sets a bow in the sky as a reminder not to do this again in the future. To this day, we look at the rainbow as a sign that the storm is over. The rain his stopped, and the sun is beginning to shine again. The story of Noah is an enigma. We love to tell it to our children, while leaving out the part about everyone drowning. The kids’ version has a boat, animals, and a rainbow. The adult version is more complicated. First you have all those dead people and animals to wonder about. Then there’s the sense of regret that seems present in God’s voice. God tells this remnant that never again will I turn loose the waters to destroy the earth. Note the reason God sets the rainbow in the sky, is so that when God again gets angry with the inhabitants of the earth, God will stop and refrain from taking action. We can all breathe a sigh of relief—it may rain and even flood, but it will never be that bad again! Of course, God didn’t say anything about fire, but that’s another story. There have been many attempts to explain the origins of the story, variations of which seems to permeate many cultures, by scientific and historical analysis. Some take the story quite literally, and assume that a flood covered the entire earth, and that all the people and animals alive today are descendants of those who got rescued on the boat. That’s one way to take it, but there are other, perhaps more likely explanations, including the suggestion that these stories reflect large flood events that proved highly destructive. Since this story arose in Mesopotamia (Iraq), it might have in mind a massive flood that inundated the Tigris and Euphrates Valley. However, the story originated, the question for us as we begin Lent Is how it speaks to our own lives. As I noted above, in 1 Peter this act of cleansing the earth is seen as prefiguring baptism, which now saves us (1 Peter 3:13-22). We don’t see the sense of regret in 1 Peter that seems present in Genesis 9. The author of 1 Peter reads the Flood story allegorically, which was a common interpretive method of the day. The Flood story should trouble us. It opens a can of worms about the nature of God. It suggests that God can and does change God’s mind about things. In fact, God can act too hastily, and then need reminders. The Noah story is a favorite among children. Boats filled with cute animals, followed by rainbows. What’s the matter with that? Except, that this is only a small portion of a larger story of divine judgment in which many perish, not only humans but all creatures large and small. Perhaps the word we should take from this reading has to do with the covenant promise. It has been noted that the Noahic covenant is the broadest of the three covenants in the Hebrew Bible, even broader than the Abrahamic covenant. 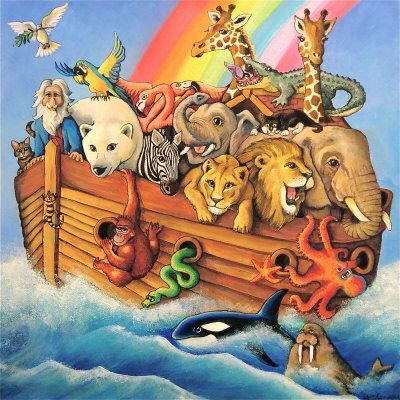 God makes a covenant with Noah, his family, and the creatures on board, and their descendants. At a time of increasing global warming, the threat of nuclear war, and growing divisions across the globe, it is good to remember that God takes a global view of things. God isn’t a nationalist, a nativist, or even, strictly speaking, a humanist. That is, God cares for the entire creation, and is committed to caring for that creation. As we begin the Lenten journey, and move forward toward the Abrahamic covenant, may we take to heart the promise of the rainbow, and remember God’s covenant with all creation? In doing this, may we commit ourselves to living out that promise in our own lives? At the same time, it might be good to consider our understanding of the nature of God. If God is love, then what do we make of stories like this? We much to ponder as we take this Lenten journey.